Fantastic Four comic books were the first super-hero series published by Marvel comic books in the "Silver Age" of comics. One of the most important titles in comic history. This was Stan Lee's and Jack Kirby's first great collaboration. The early issues were reprinted in "Marvel Collector's Item Classics", which was re-titled "Marvel's Greatest Comics"
We have 331 of the 416 issues. Annuals, Other issues Out of stock in gray. Issues # 326-350 Show all copies or only Very Good Near Mint or better. Reed and Sue return to team. Thing reverts to human form. ...And You Can't Wake Up! Big Trouble On Little Earth! Appearance of Hulk, Ghost Rider, Wolverine, Spider-Man. Eggs Got Legs! Appearance of Punisher, Hulk, Ghost Rider, Wolverine, Spider-Man. Giant-size. The More Things Change...! Return of Thing. Appearance of Doctor Doom. 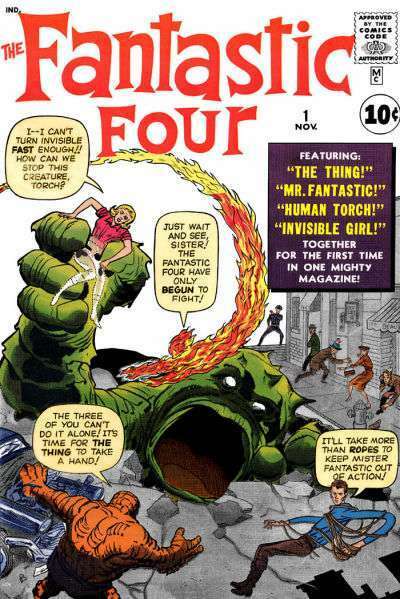 The Fantastic Four is the series that launched the Marvel age of heores. The first series of Fantastic Four (starting in 1961) is the most popular among collectors. But other Fantastic Four comic books for sale are nearly as popular. Some Fantastic Four series contain only a few issues, and others are longer, such as Fantastic Four (1998 series). All of Fantastic Four comics for sale come with our full money-back guarantee. So, if you're a Fantastic 4 fan or you're looking for Fantastic Four comics for sale, this is the place! This is the comic book that saved the comic book industry. The year was 1961 and DC had a virtual monopoly on superhero comics, which have always been the bumper crop for publishers. Superman, Batman, and re-launches of The Flash and Green Lantern, along with Wonder Woman and several second-tier heros. But, all their characters were good guys, and none of their characters had any, well, character. They were good. Through and through. And then, along came Stan Lee and Jack Kirby's brilliant collaboration, the Fantastic Four. The four squabbled like real people, had villains with good sides and heroes with dark sides. Their characters did things that real people did -- went to the barber shop, went on vacation, nearly went bankrupt. It was a family story in a superhero context. Yes, the Fantastic Four totally re-energized comics, and was the first title in the "Marvel Age of Comics". This series' success led to everything else in the Marvel family. Without a successful Fantastic Four, there would never have been a Spider-Man, or Iron Man or Captain America or Thor. The series was the definition of innovative. The characters had no secret identities, they actually lived in New York City, (no "Metropolis" for them), and they fought like siblings...in fact, Sue Storm (the Invisible Girl) and Johnny Storm (the Human Torch), WERE siblings. And they squabbled, just like you did with your siblings. And bad guys had a good side. In one sequence, which has stayed with me for 40 years, the evil Dr. Doom and Reed Richards are about to blow each other's brains out and the collateral damage would be the destruction of a valuable painting by an old master. Neither Richards or the detestable Doom could bare to see that happen. The result? An agreement to end the fight to save the painting. Great Caesar's Ghost.... there were no characters like that in DC comics!!! And, Johnny Storm, a leading star, was a teenager. In DC-land, the teenagers were the sidekicks, Robin to Batman, Speedy to Green Arrow, and Kid Flash to... well, you know. But here, a teenager was a star. His success bred the other great Marvel teenage star....Spider-Man. If the readers of comics in the 1960s were kids and teenagers, well, why not discuss their problems... like being bullied in school, or an upcoming Chemistry test. Meanwhile, Superman was concerned with how best to camouflage this giant key to his Fortress of Solitude. And, the Fantastic Four lived in a real city, New York, and Reed Richards was wondering how he could kiss Sue Storm. The 'reality' of the series was how it intermingled real people reacting to ordinary situations with the bad guys trying to take over the world. Bad guy coming after me? Well, hold on, while I pay the rent. Today, most every superhero comic has taken this enduring quality from Fantastic Four's original series. The continuity was staggering. In a day when an artist will sign to draw 12 issues of a series, Kirby and Lee teamed for 102 straight issues. The characters they created, from the Silver Surfer and Galactus to the Inhumans and zillions more populate the Marvel universe to this day. So, if you're looking for a title with great stories, great art (Kirby and Lee at their pinnacle), the Fantastic Four is the place to do.